1Patel H, Feldman M, Canadian Paediatrics Society. 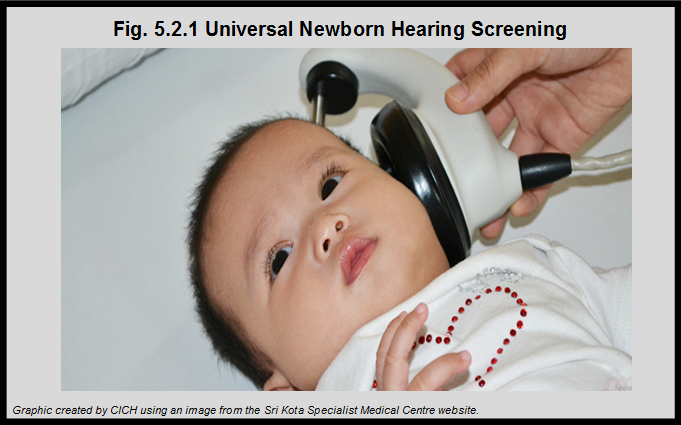 Universal newborn hearing screening. Paediatrics and Child Health 2011;16:301-5. 2American Academy of Pediatrics. Joint Committee on Infant Hearing. Year 2007 position statement: Principles and guidelines for early hearing detection and intervention program. Pediatrics 2007;120:898-921. 3Thompson DC, McPhillips H, David RL, Lieu TL, Homer CJ, Helfand M. Universal newborn hearing screening: Summary of evidence. JAMA 2001;286:2000-10. 4U.S. Preventive Services Task Force. Universal screening for hearing loss in newborns: U.S. Preventive Services Task Force Recommendation Statement. Pediatrics 2008;122:143-148. 5Le dépistage de la surdité chez le nouveau-né: évaluation des avantages, des inconvénients et des coûts de son implantation au Québec. Rapport produit par un comité d’experts à la demande de l’Institut national de santé publique du Québec. Février 2008. 6Gorga MP, Neely ST. Cost-effectiveness and test performance factors in relation to universal newborn hearing screening. Ment Retard Dev Disabil Res Rev 2003;9:103-8. 7Porter HL, Neely ST, Gorga MP. Using benefit-cost ratio to select universal newborn hearing screening test criteria. Ear Hear 2009;30;447-57.